Can Quincy Miller Save the Season for Crvena Zvezda Telekom Belgrade (And Save His Career Too)? Ryan Thompson (5, red) struggled immensely against Real Madrid in the wake of an injury to Luka Mitrovic; He and Red Star hope new addition Quincy Miller can get them back on track. After a promising 81-59 opening day win at home against Strasbourg, times have gotten tough for Serbia’s Euorleague club, Crvena Zvezda (Red Star) Telekom Belgrade. Earlier in the week in domestic play, the team suffered a massive blow when it lost captain Luka Mitrovic to a left knee injury during a rare home loss to Union Olimpija. Mitrovic, in addition to his leadership role, has been a crucial building to Red Star and head coach Dejan Redonjic’s recent success the past couple years after making the jump to the Euroleague last year, and making the second round. Last season, Mitrovic averaged 8.6 ppg and 5.2 rpg in 24 games as a 21-year-old, which earned him a 3-year contract extension this off-season. This year appeared to be a breakout year for him, as he put up a stat line of 13 points, 6 rebounds and 2 blocks in the season opener. Add that on top of a pre-season injury to forward Nemanja Dangubic that will keep him out a few more weeks, and it’s easy to see why things looked grim for Red Star as the entered yesterday’s road game against defending Euroleague Champion Real Madrid. However, even the most pessimistic of Red Star and Serbian basketball fans didn’t quite foresee their 98-71 blowout loss to the Spanish powerhouse. The first half for Red Star was especially putrid, as they scored only 6 points in the first quarter and 14 in the second to find themselves down 56-20 at halftime. 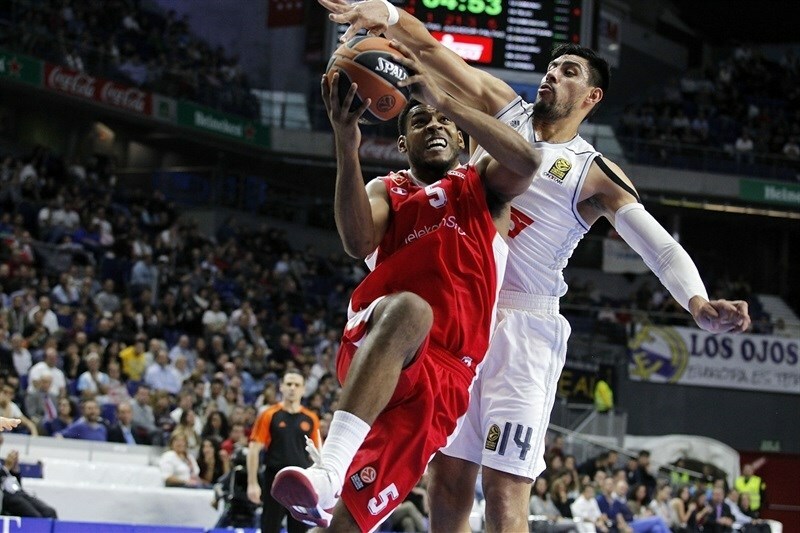 In the second half, they made the game a little bit more respectable, scoring 21 in the third quarter and 30 in the fourth, but it was obvious that Real had put in their replacements, and were simply trying to rest up after halftime to conserve their star players for the following week of games, both Domestic and Euroleague. The biggest difference in the game was the play in the post, as Red Star couldn’t stop Real in the paint, and vice versa, they couldn’t score in the paint against the talented Spanish front line either. Real shot 57.8 percent on 45 2-pt shots, with Gustavo Ayon scoring 16 points on 6 of 9 shooting on 2-pt shots, and Willy Hernangomez, playing a lot of early minutes due to Felipe Reyes in foul trouble, scoring 11 points on 5 of 6 shooting. As for Red Star, they shot 33.3 percent on 48 2-pt shots, and while German Maik Zerbes tried to pick up the slack with a 15 point performance, almost half of his points (7) came from the free throw line and he shot 4 of 10 on 2-point shots, struggling to get position and shots on the active Real post players (Real blocked 6 Red Star shots). Furthermore, they also got little to nothing from other post players such as Stefan Nastic, who went 1 of 6 from the field and played a little over 7 minutes, and recent off-season addition Sofoklis Schortsanitis, who went 1 of 5 from the field, had 1 rebound and was blocked 3 times in 13 minutes. Add those disappointing factors along with Israeli point guard Gal Mekel scoring 0 points and getting no assists (compounded even worse by Sergio Rodriguez and Sergio Llull combining for 16 assists), and it makes sense why there was a difference in Total Player Index Rating between Real and Red Star (134-60). While Mitrovic’s injury effect has already been felt by Red Star, there is help on the way. Earlier this week before their contest against Real, Red Star signed former NBA draft pick Quincy Miller, who has played for the Denver Nuggets, Sacramento Kings and Detroit Pistons, as well as the Reno Bighorns, Grand Rapids Drive and Iowa Energy of the D-League in his early 3-year professional career. Miller is an interesting pickup by Red Star, as he is still incredibly young (22 years old) and has so much raw potential, size (6-9, 210 pounds) and athleticism. However, this will be his first stint in Europe in general, let alone the Euroleague, and it will be interesting to see how Miller will adjust to the European (especially Eastern European) culture as well as the style of game from America. Quincy Miller was drafted by the Denver Nuggets, but has struggled to find a place in the NBA. Will a year-long stint with Red Star Belgrade change that? Miller probably left college earlier than he should’ve, as he declared for the draft after his freshman season at Baylor, where he played with future NBA and European professional players like Quincy Acy, Perry Jones and Brady Heslip. In college, Miller averaged 10.6 ppg, 4.9 rpg in 24.4 mpg over a 37 game span and shot 44.7 percent from the field, as well as 34.8 percent from 3-point land during the Bears’ Elite-Eight season. Miller impressed teams and scouts during his time at Baylor with his raw athleticism and his inside-outside game, but his inconsistent shooting (48.5 percent eFG%), tame rebounding percentages for a big man (7.5 offensive rebounding rate; 16.1 defensive rebounding rate), and tendency to be a “ball-killer” (his 23.1 usage rate was second highest on the team) and get the Bears out of rhythm offensively at times, was a major reason why he fell to the second round, though he was projected as a mid-to-late first round pick going into the 2012 draft. However, despite his “upside” and ability to create off-the-dribble for a player of his size, Miller’s youth and lack of experience was obvious, as he only averaged 4.9 ppg and 2.8 rpg and put up a PER of 8.6 (15 is average). Trying to build a more “playoff-ready” roster, the Nuggets let Miller walk in the off-season (as a second round pick, he didn’t have the kind of rookie deal that first round picks receive; second round picks go year-to-year after their initial contract), and in 2014-2015, Miller found himself bouncing around in the D-League and NBA. Despite the lack of security and a stable team, Miller’s most promising stint in his early professional career happened last year in the D-League during a 15-game stint with Reno, where Miller was featured in first year head coach David Arsenault’s “System”. For those who aren’t familiar, the “System” originates from Grinnell College and features constant full-court pressure defense, frequent waves of substitutions and a heavy reliance on 3-point shots (at least half of their total field goal attempts need to be from beyond the arc). Miller fit in this system like a glove, as he averaged 25.3 ppg and 7.6 rpg on 50.3 percent shooting. Miller constantly torched team from beyond the arc, but he also was able to beat slower defenders on the dribble drive to the rim, and meshed seamlessly in Reno’s fast break, consistently finishing break opportunities off of turnovers as well as made and missed baskets (Reno is always running the break, regardless of the result on defense). Take a look at a game during last year’s D-League Showcase in Santa Cruz where he scored 35 points against the Westchester Knicks. His impressive stint in Reno earned him billing as the Top D-League Prospect by the D-League Web site last season, as well as short 10-day contracts with the Kings and Pistons and a spot on the Brooklyn Nets preseason roster. But, Miller didn’t do enough to make the Nets roster, and after being cut by Brooklyn, and the D-League not really a lucrative financial option, Miller opted to sign with Red Star for a much better payday as well as a bigger role on a team that is looking to stay competitive despite their rash of injuries. The big question will be how Redonjic will utilize Miller with this roster. Miller isn’t a physical forward and he will not help much on the glass (they were outrebounded 51-33 against Real), but Mitrovic didn’t possess any of those qualities either, and he still was a productive player that Redonjic planned to build around this season. Furthermore, Red Star has those types anyways with Zerbes and Schortsanitis. What Redonjic needs from Miller is scoring and instant offense, which was painfully missing against Real, as it seemed like Red Star didn’t have the kind of go-to scorer to help them out of the various scoring slumps they suffered through in the first half of Thursday’s contest. Miller needs to be able to be “the guy” and carry this Red Star team on the offensive end, and considering Red Star likes to push the ball and play more up-tempo, it makes sense why Red Star signed Miller, who played his best basketball in an up-tempo system in Reno. Additionally, his focus and energy level are inconsistent, as he doesn’t seem to bring the same intensity level from possession to possession, which was clearly an issue for him already in high school. He’ll need to improve his toughness, particularly in terms of fighting his way through screens, something that getting stronger will likely help with. This will be interesting considering Red Star’s passionate fan base as well as the annual circumstances Euroleague teams face with the threat of being regulated with a poor season, which puts additional pressure on players, especially imports, to perform and make an impact right away. Miller can come off as passive and uncaring at times on the court, and to the common European (or even American) fan, that can be a huge insult, and prevent them from supporting a player. Red Star fans though have showed in the past that they can really get behind their players though, as evidenced by their little “bus surprise” put on by the fans for Schortsanitis when they signed him this off-season. If Miller can embrace them and the environment (which is one of the best home crowds in Europe), and be more consistent in terms of displaying his passion on the court, not only can he help Red Star win, but he can garner the kind of fan support he never really received in the States professionally or in college. And at the end of the day, when somebody is a fan favorite, they will get paid in one way or the other. That being said, at the end of the day, this is most likely temporary. Miller solves an immediate need and has the potential to fill the role that Mitrovic would have had prior to his injury, which is as the team’s primary dynamic scorer. There is no questioning his skills, but how Miller adjusts to Redonjic, the Red Star team and European basketball will be key to whether Red Star rebounds after the early setback to Real, and Miller revitalizes his status as a prospect, or they continue to regress and Miller proves that he is another “athletic” talent who doesn’t have the makeup to put it all together at the professional level. Let’s face it. Red Star needs Miller to continue their Euroleague success from 2014-2015, and Miller needs Red Star to find his way back to the NBA. Whether or not this “relationship” can or will be successful for both parties though is yet to be determined, and it will be interesting to see if Redonjic can be the “counselor” to make it work this season. It’s Only One Game, but Should We Worry About Maccabi Fox Tel Aviv? Devin Smith and Maccabi Fox Tel Aviv struggled to score as well as stop CSKA Moscow in their opening day 100-69 loss. One of the premiere and most anticipated games heading in week 1 had to be between CSKA Moscow and Maccabi Fox Tel Aviv in Moscow. A rematch of the Final Four semifinal two years ago, where Maccabi pulled a stunning 23-12 4th quarter rally to upset the favored CSKA 68-67, CSKA killed the excitement early and also returned the favor and then some by beating Maccabi by 31 points (100-69) in what was the biggest blowout of week 1 in the Euroleague. While in some cases, the CSKA win is an indicator of how good this CSKA team may be this year, and how they are the early odds-on favorite to win the Euroleague title, it also demonstrated the issues this Maccabi squad will face this season. After a big off-season where they acquired big names such as former Los Angeles Laker and Clipper Jordan Farmar and VTB league stud Taylor Rochestie, as well as promoted top Croatian prospect Dragan Bender from the developmental league, many expected Maccabi to continue their annual string and run of competitiveness in the Euroleague, despite playing in a difficult Group D that also includes Darussafaka Dogus of Istanbul, Brose Baskets of Bamberg, and Unicaja Malaga in addition to CSKA. However, the lackluster performance on opening day exposed some major holes and issues that may present some difficult challenges for Maccabi when it comes to advancing beyond the second round. 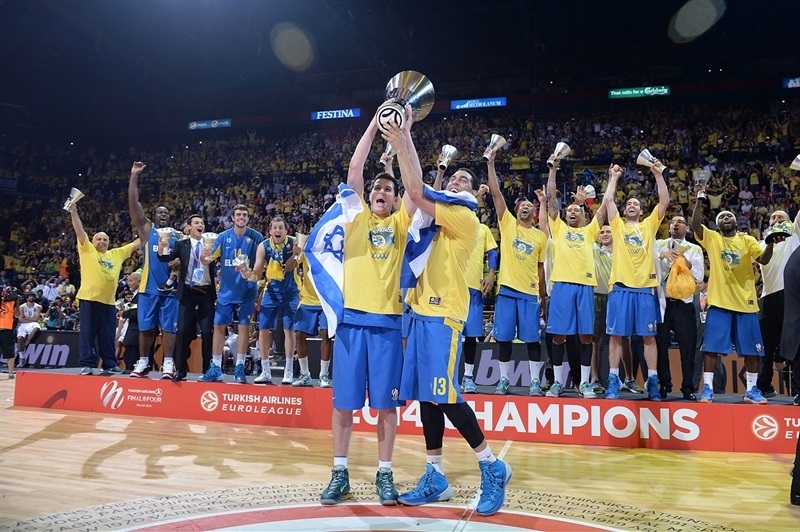 2013-2014 was a dream season as Maccabi went from underdog to winning their 6th Euroleague title in club history. The 2013-2014 Maccabi squad was to European basketball what the “Hickory Huskers” were to Indiana high school basketball lore. After an 8-6 and 3rd place finish in their group in the second round, Maccabi pulled off a 3-1 upset over EA7 Emoporio Armani Milan in the quarterfinal to earn a surprise berth in the Final Four. After upsetting CSKA thanks to their miraculous 4th quarter of play, Maccabi carried on the momentum in the championship game, defeating the heavily favored, and star-studded Real Madrid 98-86 to earn their 6th Euroleague Championship in club history as well as finish the year 21-9. The club relied on a hefty mix of wily veterans and hungry role players. Maccabi mainstays such as wings Yogev Ohayon and Guy Pnini were key as ever, but they also got solid years from fellow perimeter players such as David Blu (who retired shortly after winning the title), Joe Ingles (who parlayed his strong, multi-skilled performance that year into a contract with the Utah Jazz), Tyrese Rice (who left for more money and a bigger role in Moscow with Khimki the following year) and Devin Smith. Add that with the massive, but productive post presence of Sofoklis Schortsanitis and the strong post flexibility of Alex Tyus, and it makes sense that head coach David Blatt was able to lead Maccabi to a surprise Euroleague championship. Blatt, a Princeton graduate and established as well as heavily respected European coach (he had coached Maccabi for years and also earned rave reviews in helping Russia to a bronze medal in the last Olympics), had built a solid, and battle-tested team that showed a strong resilience throughout the 2013-2014 campaign (they certainly took their lumps in the second round, and that may have helped them not just be overlooked going into the quarterfinals, but learn and improve upon their flaws). They averaged 79.5 ppg, and relied heavily on the 3-point shot, as evidenced by 36 percent of their total field goal attempts being from beyond the arc. However, they were efficient in their style of play, shooting 39.9 percent from beyond the arc and 54.4 percent on their 2 point attempts. Sure, his roster didn’t have the mainstream or higher-paid names of bigger clubs such as Real, CSKA or even Olympiacos, but they were still extremely productive, and better yet, they fit Blatt’s, perimeter-oriented, Princeton-influenced system perfectly, which sometimes can go a lot longer way than just pure talent (as demonstrated by Maccabi winning the Euroleague championship). After winning the 2013-2014 title, Blatt sought greener pastures and a higher pay day in the NBA with the Cleveland Cavaliers. As his replacement, Maccabi hired Guy Goodes, a former Maccabi player (as well as general Israeli basketball player, as he played from 1985-2004 with various Israeli League teams) and assistant under Blatt from 2010-2014. Goodes’ familiarity with the Maccabi roster seemed to be a promising sign and major reason why they hired him, and with most of the talent back, and some key additions in dynamic point guard Jeremy Pargo and versatile forward Brian Randle, many expected Maccabi to make a serious run in their defense of their 2013-2014 Euroleague championship. Unfortunately, the team never quite meshed under Goodes. Though they did finish 16-11 and made it to the quarterfinals, their Expected W-L (check basketball reference.com for what Expected W-L is, which is basically a Pythagorean W-L taking into consideration point scored and points allowed) was one of a sub. 500 team (specifically 13-14) and they were utterly dominated in getting swept by Fenerbahce Istanbul in the Euroleague quarterfinals. The team struggled with consistency from their roster, as they got solid seasons from Pargo and guard Devin Smith, as well as post players Randle and Alex Tyus, but they got an underwhelming campaign from Sofoklis Schortsanitis, who averaged only 14.2 mpg and 6.5 ppg and 2.3 rpg in 26 Euroleague contests. Considering he was such a big factor in their 2013-2014 title run, the lack of production from the longtime Greek standout did not help their cause much in the defense of the title. Additionally, it never seemed like anyone really stood out for Maccabi other than perhaps Smith, who was not just the team’s leading scorer in Euroleague play at 15 ppg, but also leading rebounder at 6.1 rpg. For a forward, that is not a bad statline to have, but Smith was a guard, which proved to be a Catch-22 for Maccabi. Yes, he was an incredible player who played hard on both ends of the floor and had tremendous impact for Maccabi in 2013-2014 (and it was recognized, as he earned 2nd team All-Euroleague honors and made the All-Imports team along with Pargo). That being said, when your guard is your leading rebounder, that screams all kinds of alarms with the weakness and lack of physicality from your post players, and that is not a recipe for success. Goodes and Maccabi tried all different kind of combinations, and brought in some late additions such as Joe Alexander to boost their depth and versatility and size, but it just wasn’t enough. Maccabi chemistry-wise just seemed to be a shell of the Blatt-coached 2013-2014 team that never really felt like a serious contender, even though they made it to the playoffs. 17-year-old Croatian Power Forward Dragan Bender will be key to Maccabi’s Success and Whether they Bounce Back from the CSKA loss. 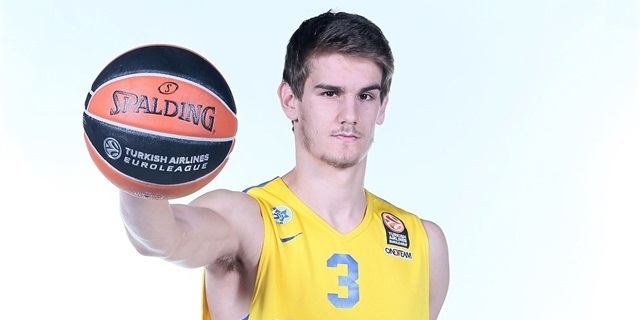 After the team’s disappointing sweep in the playoffs and the lack of production in 2014-2015, Maccabi let Schortsanitis go and replaced him in the post with 17-year-old Croatian super-prospect Dragan Bender and super-athlete Trevor Mbakwe. Bender has been a hot topic in all kinds of draft circles, as many scouts like his inside-outside ability, as well as his athleticism and maturity for a teenager playing at such high level with many long-time veterans. As for Mbakwe, he has been categorized as one of the strongest “athletic” talents in European circles, and has the potential for a breakout, as his offensive game, which has been slow to develop ever since his college days, has come a long way since he was at Minnesota. The biggest veteran addition had to be Jordan Farmar, a former Los Angeles Laker and Clipper who was picked up to solidify the guard position along with Maccabi mainstays Smith and Ohayon as well as fellow newcomer and budding European player Taylor Rochestie (a former Washington State product under Tony Bennett), who was the leading Euroleague play scorer on Nizhny Novgorod last season at 18.3 ppg (Nizhny Novgorod was regulated to the Eurocup this season). Though Farmar has played the point guard position mostly in his career, he mostly likely will contribute as a wing/shooting guard in Goodes’ perimeter-based offense, especially with Ohayon seeming to have firm control over the point guard position and the heralded Smith on the other wing. That shouldn’t be too out of bounds for Farmar, as he played the point in Phil Jackson’s Triangle offense, where he ceded ball control to superstars like Kobe Bryant (as typical in Jackson’s version of the triangle). Farmar may not have the explosiveness of Pargo or Rice, two of Maccabi’s high-profile imports from the past two years, but he presents a long-range threat and veteran floor sense that should impact the offense for Maccabi, something that didn’t always happen on the offensive end of things for Maccabi in 2014-2015. Either way, with a strong backcourt, a stronger emphasis on athleticism in the front court, and some improved depth, Maccabi on paper looks better than they did a year ago, and they are set up well for the future with their acquisitions of young talent like Mbakwe and Bender (however long Bender should stay). That being said, predictions and the preseason aren’t necessarily crystal balls, and despite some strong performances against EA7 in the NBA Global Games exhibitions, it all came crashing down for Goodes and the Maccabi squad in week 1 of the Euroleague season. 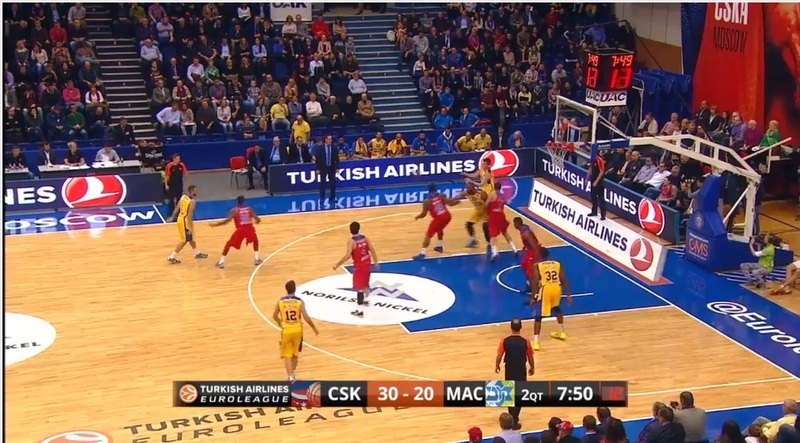 To say CSKA Moscow beat Maccabi is probably the understatement of the Euroleague season so far. The Russian power’s 100-69 dispatch of Maccabi not only proved how good CSKA could be this season, but the glaring issues that Maccabi needs to solve offensively and defensively in a Group that is no slouch with competitive teams like Unicaja Malaga and Brose Baskets also competing for the four spots to get into the next round of play. If Goodes’ team plays this week against Unicaja like they did against CSKA Moscow, they could easily be 0-2 and looking at a very large deficit in terms of point differential for the remainder of the regular season. Let’s start out with the defense for Maccabi which really struggled, especially in their pick and roll communication. While Bender looked like a 17-year-old playing his first game in the Euroleague, he did some good things, especially on the offensive end. If Maccabi wants to be successful, Bender will be a big reason why. He gives them the kind of offensive versatility they simply can’t get from Mbakwe or Arinze Onuaku, a reserve center. (Though he is on a limited contract, and with the signing of Ike Ofoegbu just this week, I think Onuaku’s days could be numbered, especially since Randle will be coming back after sitting out game 1.) That being said, his defense (as well as the Maccabi perimeter defense) is a work in process, especially when defending the pick and roll. There were times where he was in no man’s land on the pick and roll and sagging way too off the kind of players you cannot sag off of, which opened up easy, lately contested shots beyond the arc. On the pick and roll, a lack of communication from the perimeter players, and Bender’s tendency to be non-committal in the lane before the pick and roll play developed either led to a lot of open jump shots, or easy drives to the lane for layups and dunks. When you play that kind of hesitant defense, as Bender showed, good teams like CSKA are going to shoot over 60 percent from the field, like they did last week. However, I am not putting this all on Bender. He is still young and a project and still 17 years old. Playing in the Euroleague is tough for the wiliest of vets, and for Bender to be showing some production in game 1 is a promising sign. Furthermore, I think a lot of his defensive issues stemmed from hesitation and the mismatches CSKA threw at Maccabi rather than Bender’s natural defensive ability, which I think is good to at least above-average due to his size, length and athleticism. As you can see, this pick and roll starts pretty typical. 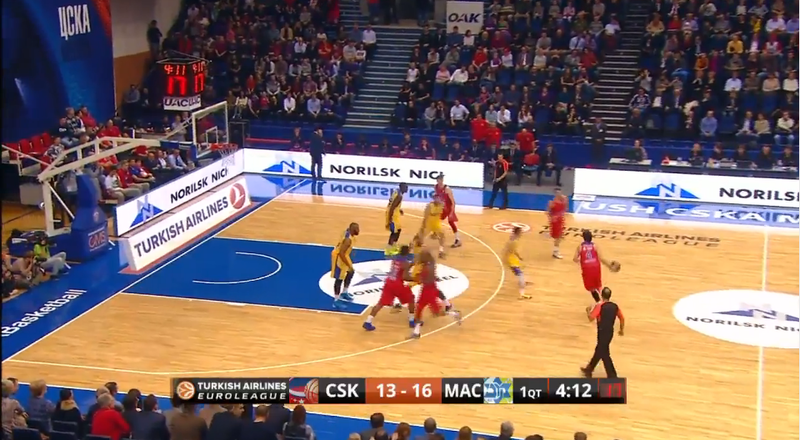 CSKA’s post sets the high ball screen, Onuaku sages a bit, Mbakwe slides to play some help defense and the guard (in this case Rochestie) plays the point initially tight. But if you look at the play before, you can see that the miscommunication is already starting. The play started with a Teodosic dribble hand off, and Rochestie and Farmar (who initially guarded Teodosic) were supposed to switch. 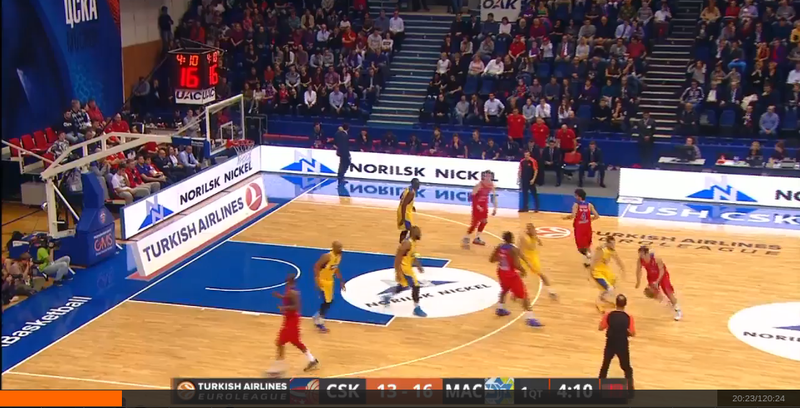 But as you can see from the picture above, it doesn’t seem that Farmar knows there is a switch so they are both chasing the CSKA player who has just received the handoff. This leaves an overplay on the left wing side, which forces Onuaku to sag because there are already two defenders on the ball handler (the defender who is staying on his man after the hand off is going over the screen). After the screen, Farmar who initially stayed realizes he needs to switch, especially considering how much of a sniper Teodosic is from beyond the arc. So he changes directions and sprints out to try and recover. Rochestie and Onuaku are forced to play the pick and roll, but, because Onauku played the pick and roll so soft initially, he really didn’t get a good “feel” on the screener and you can see him up top (Hines) having a lot of space to make his way to the basket. Mbakwe should help and be closing the lane here, but because Farmar, who didn’t switch initially, changed his mind, Mbakwe isn’t in prime help position. If the defender had kept his responsibility originally, Mbakwe probably would have closed this pick and roll lane sooner. But, because there was such last-minute communication, he leaves the lane open because he thought Farmar would have it. And CSKA takes advantage. Onuaku and Rochestie are sucked in the pick and roll, and Mbakwe is way too late on the help. Hines gets the open pass and is able to throw it down for easy points. There has to be better communication than that when defending the pick and roll. You cannot do last-second toggling between staying and switching on a player in the pick and roll. That leads to easy possessions and points for the offense, as evidenced above. On offense, Goodes still prefers a perimeter-oriented lineup like his predecessor Blatt. But, understandably, he wants to utilize the depth and talent of his post players. However, the problem is that his post players are a bit raw and unrefined on the offensive end, and because of this, they have a tendency to freelance in bad ways and kill Maccabi’s spacing, which causes shots to be more difficult than they should be. Take a look at possession where Farmar passes to Pnini coming off an Onuaku baseline screen. The screen is not the best, but the play idea is sound. The baseline screen with the pass to the corner can free up the easy shot for the high percentage corner 3 pointer, a post pass to take advantage of a 1 on 1 mismatch in the block, or open up lanes for dribble penetration. That is…as long as the spacing is sound on both ends. But look at Mbakwe in the opposite post. He is drifting toward the low block instead of getting to the short corner or better yet, arc. And it only gets worse from there. Pnini decides to drive, which is not a bad idea since they don’t switch off the screen. But look what Mbakwe does: he drifts down the low block. This is bad for all kinds of reasons. First off it shrinks any spacing and basically leads the defender right into the play. You can see there are 3 defenders around the rim now, taking away any easy shot possibility Pnini may have. And second, not only are there 3 defenders in the post, but 2 players are being fronted in the post as well, taking away any kind of pass for Pnini on the drive. So, Mbakwe’s decision not only took away Pnini’s driving lane, but also any passing bailout options, since all the Maccabi players are effectively covered on this drive. A tough fade-away, easily-contested jumper. That is not good offense and the spacing was a key contributor to that. While Goodes may want to utilize his deep front court, he needs to put in the right combinations so they’re not shrinking the lanes like Onuaku and Mbakwe did on frequent occasion last week. Do Maccabi Fans need to worry? Goodes is a fan favorite because of his history as a player, but he hasn’t really satisfied the masses on the court after taking over for Blatt. 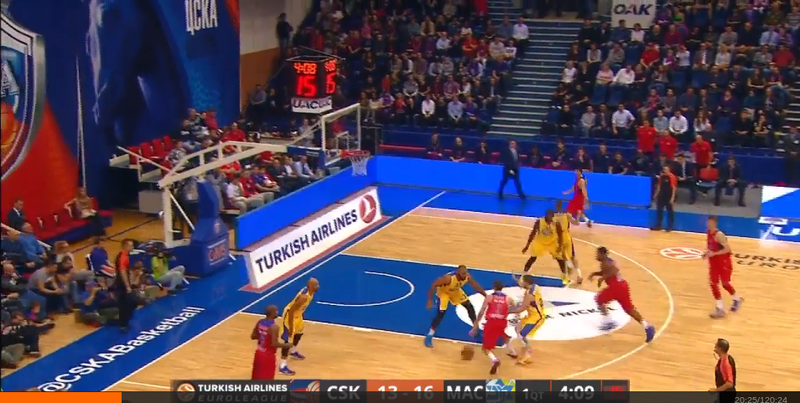 Unlike Blatt, Goodes seems a little overwhelmed strategically, and that was on full display against CSKA. Instead of focusing on spacing the floor with his talented perimeter players, he frequently used 3-out, 2-in lineups that seemed to do more harm than good (especially with Onuaku and Mbakwe). The silver lining in all of this is that Randle was out last week and is expected to be back for Unicaja, and Ofoegbu will be a better fit for what Goodes wants to do than Onuaku, who just seems like a square peg in Maccabi’s round hole offense. Add that with Bender more likely to be comfortable with a game under his belt and against a less high profile opponent, and Maccabi certainly can bounce back after such an embarrassing defeat. If there is anything to keep an eye on against Unicaja, it will be their defensive communication, especially against the pick and roll. 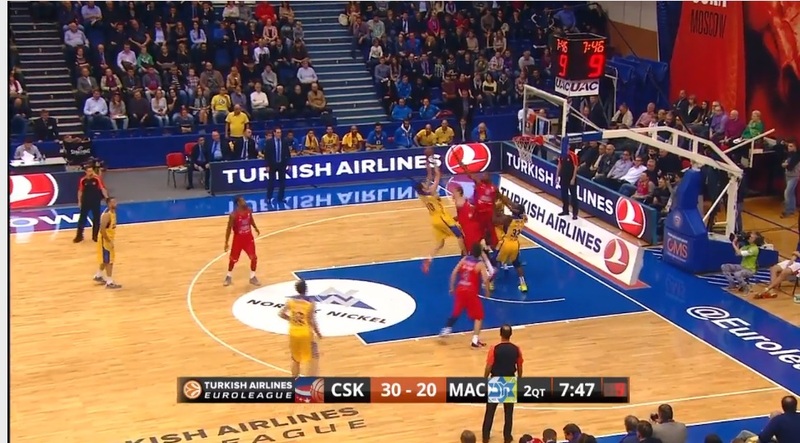 CSKA is a team loaded with talent, so its not surprising that they made them pay for their errors on the defensive end. I will not be surprised to see CSKA beat more teams by 30 this year at home. But, Unicaja is not CSKA talent-wise, and in interviews, improving the defense seemed to be a priority for Goodes and his team in practice. It’ll be interesting to see if Goodes and Maccabi make the proper adjustments, and will be more sound in their communication and defensive responsibilities. If they do, then this CSKA game might a blip on the radar. If they continue to struggle, and let Unicaja do easy work around the rim like CSKA (and it’s possible with post players like Richard Hendrix and Fran Vasquez who can do serious damage for Unicaja), then maybe opening week is a sign of a long season to come for Maccabi and their fans. Carmelo Anthony and the Knicks could be better than people expect…as long as Head Coach Derek Fisher doesn’t provide any more distractions. The New York Knicks have been an unmitigated train wreck the past two seasons. Two years ago, after finishing 54-28 the year before (which included an Atlantic Division title but a disappointing 2nd round exit in the playoffs to the Indiana Pacers), the Knicks failed to live up to expectations that they could compete with LeBron and the Heat and the Pacers in the Eastern Conference. Though Carmelo Anthony put up a banner All-Star year for the Knicks, averaging 27.4 ppg and 8.1 rpg on 45.2 percent shooting in 77 games, and put up 10.7 win shares and a PER of 24.4, the Knicks’ franchise player failed to get much help from his supporting cast. Tyson Chandler was the team’s 2nd best player on a Win Shares basis (4.9) and he only played in 55 games due to injury. Amare Stoudamire and JR Smith had regression seasons (3.8 and 3.7 win shares, respectively) and Raymond Felton had one of his classic “off” years (i.e. he rested on his laurels and didn’t stay in shape), as evidenced by his PER dropping from 15.9 in his first season in New York to 12.9 in year two. .
With all these regressions from veteran players who were expected to be key contributors, the Knicks struggled to find any consistency on the court despite Melo’s best efforts. Their most glaring weakness was on defense as they ranked 24th in the league in defensive efficiency. And thus, instead of repeating as Atlantic Division champs and challenging the Heat and Pacers in the East, the Knicks missed the playoffs with a 37-45 record. Though the Knicks expected W-L (39-43) was a bit better than their actual, it didn’t hide the fact that 2013-2014 was a disappointing campaign, further evidenced by their SRS (Simple Rating System) of -1.40, which ranked them 19th in the league. After the year concluded, Phil Jackson was hired as Team President to restructure the franchise from the inside-out, and the first one to go was head coach Mike Woodson, who failed to build on the momentum generated from his first two seasons as head coach (Woodson was 72-34 as Knicks head coach prior to 2013-2014). After a failed run at Steve Kerr (who took the Warriors job and led them to a NBA title), Jackson hired former player Derek Fisher, who had just recently retired as a player. Though Fisher had no coaching experience, Jackson hired him because he was a respected player in the league among his peers, and he knew the “Triangle” system from his playing days that Jackson wanted implemented in the Knicks organization. In the off-season, Jackson’s presence was felt, as he let Chandler, Felton and Andrea Bargnani walk, and only signed Jason Smith in free agency. Instead of relying on veterans who had been inconsistent, Jackson decided to go a more organic route, trying to build within with guys like Cole Aldrich, who had showed some promise in 2013-2014 and Smith, a crafty inside-out center whose skill set was similar to Triangle centers Jackson had coached in the past like Luc Longley, Bill Wennington and Bill Cartwright. The Knicks were trying to craft a new identity, similar to Jackson’s Bulls and Lakers teams, where the team complemented the superstar (in this case Melo) in the Triangle offensive system. Unfortunately, the Triangle never took off, and by mid-year, with the Knicks clearly going to miss the playoffs for a second straight year, Jackson shipped off mainstays Smith and Iman Shumpert to Cleveland for draft picks and expiring contracts. By February, Stoudamire was bought out, ending a relationship that started out great, but slowly died out in frustrating fashion (few people remember how exciting Amare was in his first year in New York before Melo arrived). With bare bones for a roster, and Melo only playing 40 games due to injury, the Knicks finished 17-65. Not only was it the worst record in the league (something that isn’t easy to do when you think that the Sixers seemed to be shooting for that since Draft night), but they also were putrid when it came to offensive rating (29th), defensive rating (30th) and SRS (30th). Knicks fans have been use to disappointment and losing in the past (see the documentary “When the Garden was Eden” to get an idea of how bad the Knicks used to be before the Walt Frazier and Willis Reed days), but even this was tough to stomach. Just three years ago, the Knicks were thinking they could compete for a NBA title, now they were back to stage 1 of a total rebuild. 2014-2015 couldn’t have gone worse for Knicks fans. That being said, I think the Knicks will improve in 2015-2016, and I think a healthy and motivated Carmelo Anthony will be a big reason why (along with a better suited roster for his talents). However, whether the Knicks see a modest 8-12 game win improvement or something more substantial will fall on the shoulders of second year head coach Fisher, and his improvement from 2014-2015 which, unlike Melo, is something I have less confidence in. Rookie Kristaps Porzigins will complement Melo well on the court, and allow Melo to play his more natural position of small forward. The Knicks have struggled defensively the past couple of seasons, and the most common idea is that Melo is to blame. Critics cite his stronger focus on “offense” as a reason why the Knicks defense hasn’t clicked, consequently contributing to the recent team decline in performance on the court and in the win column. I am not saying that Carmelo Anthony is an elite or even above-average defensive player. But he is certainly not as bad as people think, and he has proven to use his 6’8, 230 pound frame to his advantage. The problem the past few years for Melo defensively is that he’s been playing mostly out of position at the power forward spot. In 2012-2013, Melo played power forward 72 percent of the time and in 2013-2014 he played the position 62 percent of the time. Playing the stretch 4 can be an advantage for a team on the offensive end (which Melo took advantage of quite a bit thanks to his impeccable mid-range game), but on the defensive end it can be taxing as well as ineffective. And that proved to be the case, as more “physical” power forwards tended to take their toll on Anthony. Furthermore, considering how much the Knicks depended on him on the offensive end (his usage rate was 35.6 in 2012-2013, which led the league, and 32.2 in 2013-2014), it made sense that Melo may have struggled or put less effort on the defensive side of things. When you play a full-season, it’s difficult to play 100 percent on both ends. Something has to give, and in this case, that proved to be Melo going toe to toe in the block with NBA power forwards. When Chandler was healthy, it wasn’t a bad thing because he could clean up any of Melo’s mistakes. But when Chandler wasn’t healthy (as in 2013-2014), his defensive inefficiencies were made more glaringly obvious, though as stated before, considering Melo is not a natural power forward, it should have been expected. Last year, Melo made the transition to small forward more, as evidenced by him playing small forward 77 percent of the time (his time at PF dipped to 22 percent). However, Melo only played 40 games, so this change was hardly noticed or had any impact, especially considering in the 40 games Melo did play, he struggled through nagging injuries. But, at the SF position, Melo’s game shines the most. As mentioned before, he is an impeccable mid-range shooter, a lost art in this era of efficiency and the 3-point shot, but still a talent nonetheless if the player is exceptional in the mid-range, which is the case with Melo. In the past 3 seasons, Melo has shot 44.1 percent, 44.7 percent, and 44.5 percent from 16 feet to the 3 point line, the area typical of the mid-range shot. Those percentages are extremely strong, especially when you compare him to players like Kobe, who has never shot over 42.9 percent from that distance and that was in 2009-2010; and LeBron, who shot 44.7 percent in 2012-2013, but has seen his shot regress to 36.6 percent and 37.7 percent in the mid-range the past two seasons, respectively. Analytic people might not favor the mid-range, but they will agree that if someone can do it consistently well, then it is worth it for the team, and that is the case with Melo who has proved he can shoot the mid-range effectively on a consistent year to year basis. Heck, look at his 62 point game below from a couple of years ago and you can see how his mid-range game opens up so many things for him as a scorer. It is so crucial to his ability to dominate as an offensive player, something that hasn’t been seen since MJ. But while the mid-range is the strongest aspect of Melo’s game, his diversity of scoring skills (which he has developed tremendously from his Denver days) is what makes him one of the NBA’s best pure scorers. And furthermore, it also makes him more dangerous when he is playing small forward, where he outmatches opposing small forwards in terms of size. While Melo can torch teams from the mid-range, he can post up smaller wings in the post, or he can stretch them out and hit the 3 when needed. Prior to his injury filled-year, the past few seasons had seen Melo utilize the 3 point shot a bit more. In 2012-2013, 27.8 percent of his field goal attempts came from beyond the arc, and in 2013-2014, 25.3 percent of his shots were 3-pointers. Even last year, 22.2 percent of his shots were from 3-point land, which still would surpass any percentage he sported from his Denver days (the highest 3pt FGA percentage he had with the Nuggets was 14.6 percent, which was his rookie season). And though he shot more from beyond the arc, he proved that it is worth it, as his 3pt FG percentage was 37.9 in 2012-2013 and 40.2 percent in 2013-2014. Though it fell to 34.1 percent in 2014-2015, Melo was unhealthy, and considering he has had a full off-season to recover, and judging from his early results so far in pre-season (where he is looking like Old Melo again), it would not be surprising to see his 3-point percentage jump back to that 2012-2014 range. With his ability to take and own smaller defenders in the post with his size, and stretch cheating or lumbering defenders with his mid-range and 3-point shooting ability, it makes more sense for Melo to see more time at the Small Forward position. But of course, in order to do that, the Knicks need to have a sound option at the 4 spot, which they haven’t really had the past few years. And that is where rookie Kristaps Porzingis comes in. Porzingis, the Knicks’ first round pick (and 4th overall) in the most recent NBA Draft, may not be a household or popular name with typical Knicks fans. And it is understandable (though unfair and unfortunate) that the nightmares of Darko and Tskitishvilli come to mind with the drafting of Porzingis. But, Porzingis is a multi-talented player who fits into what Jackson wants to do with this team. Early in the Summer League and Preseason, Porzingis has showed a strong, inside-outside ability and a willingness to go toe to toe with physical power forwards. He hasn’t always been successful, and he still needs to get stronger, but I believe the early results have been promising so far. At the very least, he takes pressure off of Melo from playing the 4, which will open up things more for Melo on the offensive end, and put less pressure on him on the defensive end. If fans are patient with him, it would not be surprising to see Porzingis as the Knicks’ third or second best player as soon as next season. He is only 20 years old, but take a look at some of the highlights of him below and it’s easy to see why the Knicks drafted him over more proven prospects like Justise Winslow and Stanley Johnson. Again. He’s only 20 years old. And for those that are thinking “Another Darko”, Jackson has assembled this roster to support the big man from Latvia. European players like Jose Calderon and Sasha Vujacic (who both will be key to the Knicks’ on court success) will be strong mentors to Porzingis who can also relate to him as fellow European players who adjusted to life and play in America. That is something Darko never had and undoubtedly stunted his development early in Detroit. 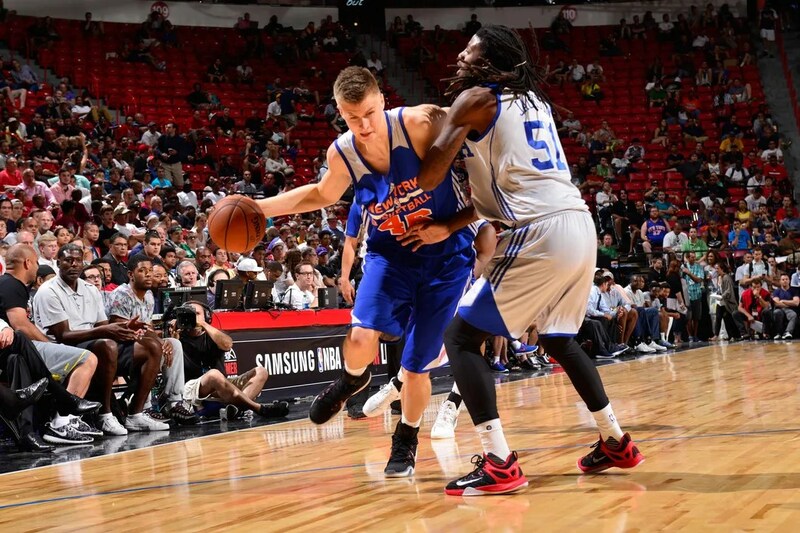 Already, Porzingis has cited some good rapport and mentoring from Vujacic, and that is a good sign that will not only help Porzingis’ development, but make him more effective on the court, which consequently will make the Knicks, as well as Melo better this season. This Knicks team will be better in 2015-2016. If Calderon stays healthy, he will certainly be a better fit for this offense and team than Felton ever was. Vujacic is an underrated 3-bomber who has proven to fit well in Jackson’s Triangle. Free agent post pickups like Robin Lopez and Kyle O’Quinn and wing Aaron Afflalo will make the Knicks not only a better defensive team (which has been lacking the past couple of years), but also a tougher, and more well-rounded squad as well. All the pieces are in place, frankly, for a dark horse season where the Knicks could surprise some people in the Atlantic as well as the Eastern Conference. Considering the Detroit Pistons, the Milwaukee Bucks and Indiana Pacers all get better with some key off-season acquisitions, that is not an easy statement for me to say. Nonetheless, I really truly believe that the Knicks’ off-season was one of the more subtle, yet effective ones around the league. But unfortunately, what makes me hesitant that the Knicks will live up to that “dark horse” status is Fisher as head coach. Last year, Fisher looked overwhelmed and under-qualified to lead the Knicks, even for “first year head coach with no coaching experience” standards. Fisher struggled to find an offensive or defensive identity with this team, and they often looked lost and disjointed as a team on the court, with no leadership or sense of direction. Now, I know by February the Knicks were obviously playing for draft position, but so were the Sixers, and Brett Brown seemed to have his team prepared night in and night out. You can still tell a well-coached team even when they are tanking, and the Knicks were far from that in every aspect of the game. Now, the adjustment from year 1 to year 2 is huge for a coach. We even saw that with Jason Kidd, who started off horrendously as a head coach only to lead a Bucks team, which had the worst record in the league the year before he arrived, to a playoff berth and a six-game slugfest with the Bulls despite having one of the youngest rosters in the league. It is possible Fisher really learned from his first year and has made some adjustments. It is possible that Fisher will be better with a healthier roster and some more established talent that fits the Triangle better. It is possible that Fisher will be better with a healthy Melo. Fisher seems to be well-liked by players around the league and Melo doesn’t seem to be an exception to that rule. It is not out of the question to think Fisher will empower and put the leadership responsibility of the team squarely on Melo like Jackson did with MJ, Shaq and Kobe. But there are so many things that make me skeptical of Fisher. Last year’s record and performance is one thing. However, I think of his time as the Union player’s rep where he basically allowed the Players Union to get swindled by Billy Knight during the lockout. I have been utterly disgusted by his poor decision-making in this whole Matt Barnes ex-wife fiasco (though I do put 90 percent of the fault of this situation on Matt Barnes, who has proven once again to be a jerk of massive proportions). Fisher has the potential to be a good coach and the coach Melo and this Knicks team needs. But he doesn’t have a great track record beyond his on-court playing days, and while that isn’t a total indicator for how a coach will perform (Mark Jackson had his off-the-court issues too, but he experienced on court success with the Warriors), it certainly doesn’t help the perception that he has everything under control, which is essential as a NBA head coach. Maybe this Barnes incident is just a blip on the radar. Maybe the player’s union stuff was more Knight and Fisher was just the scapegoat because he was the Player’s union president. The past is the past. But, the bottom line is this: the Knicks have real potential. They could surprise people, especially if Melo is healthy, as he says, and they get a full season from Calderon. This roster fits what Jackson wants to do with this franchise in ways last year’s couldn’t even imagine. And it’s Fisher’s responsibility to make that happen. Fisher and Jackson may have a great relationship from their Laker days, but Phil is too competitive, and Knicks fans are too restless and impatient to put up with another season like last year. Keep an eye on Fisher. Keep an eye on Melo. Keep an eye on the Knicks. 2015-2016 could be the year the Knicks turn the corner or when they make another change. And you can guarantee that if it’s the latter, that change will begin with Fisher. The passionate and rowdy fans of Olympiacos will be expecting a 7th Euroleague title this season, which would be the most in Euroleague history. If you read the Euroleague Group A preview, it sounds like Fenerbahce Ulker Istanbul and Real Madrid seem to be head and shoulders above the competition in their group. But while they clearly are favorites, I would not under-estimate the potential of the other four in the group, especially Crvena Zvezda Telekom Belgrade and Khimki Moscow, who all have enough interesting pieces on their respective rosters to provide more challenge than expected in the group. I can’t help but see anyone but Fenerbahce or Real Madrid emerging as the top dog from the group, but it will be a night-in, night-out slog for them, especially in the initial 10-game stretch. One team will be eliminated from the playoffs that would have qualified had they been in a different group. Group B seems to be that “other” group. Olympiacos finished as the runner-up in last year’s Euroleague Final Four, and they return most of the horses that nearly got them a championship. Furthermore, Fenerbahce’s Turkish rival Anadolu Efes Istanbul also remains a contender thanks to another year of Dario Saric, who has Philadelphia 76ers basketball fans hoping and wishing he will make it to the states soon and in one piece. (I mean, you can’t keep tanking forever, right?) But other than that? EA7 Emporio Armani Milan added some interesting talent in former Purdue Boilermaker and Minnesota Timberwolf Robbie Hummel and Croatian big man Stanko Barac, but they still are a bit of an unknown quantity after their up and down campaign a year ago. And the remaining three clubs (Cedevita Zagreb, Limoges CSP and Laboral Kutxa Vitoria Gastiez) really appear to be lukewarm competitively without much high end talent or depth to compete with the top dogs of the group. But, when you have one of the Euroleague’s best teams (Olympiacos) and most interesting players (Saric), it makes your group worth watching, even if it doesn’t have the competitive depth of some of the other Groups. When it comes to talking about Olympiacos, the discussion always starts and centers on standout Greek guard Vassilis Spanoulis. Spanoulis has been the catalyst for Olympiacos for quite a while, and he was crucial in helping Olympiacos to another Euroleague title appearance last season (which they lost 78-59 to Real Madrid; though to be fair, Madrid had the home court advantage). In 2014-2015, he averaged 14.4 ppg, 5.5 apg and a PIR of 14.4, all team-leading categories. When it came to usage in Olympiacos’ more methodical attack, no one was more important last year for Olympiacos than Spanoulis. Though he is a year older, the pressure and responsibility to carry this squad in the Euroleague will remain on him. How he plays will most likely reflect how well Olympiacos does this year and whether or not they will get another crack in the Euroleague Final Four. Spanoulis is not just the face of Olympiacos basketball, but the face of Greek basketball as well. His time and contribution to the Greek National Team has been long noted, and it was a bit bittersweet for him and fans of his as this latest Eurobasket will be his last appearance for the Greek National Team (as profiled in this post by Euroleague Adventures). Furthermore, as noted in the EA post by Sam Meyerkopf, time is reaching an end for Spanoulis’ career, and his legacy is a bit mixed, as he has struggled to share the limelight with others (most famously in Panathinaikos; Olympiacos’ Greek club rival) as well as take care of the ball (he is known for being a turnover machine, as evidenced by his team-leading 3.1 TOPG last season, which kills his assist rate). But Spanoulis still can be a wildly productive and entertaining player, and that was on full display in the Euroleague final in 2013 where he absolutely torched Real Madrid for 22 in the Euroleague Final (all in the 2nd half). Check out the video and some of the shots he makes, especially at the 2:20 mark where his make from near half-court is the dagger that puts Real Madrid out for good. Nonetheless, while Spanoulis will be a critical part of the team, they will need help if they want to finish the job and earn another Euroleague championship to their trophy case. Olympiacos has done that adding a lot of young, athletic talent in Patric Young (formerly of the University of Florida) and Daniel Hackett (a former USC Trojan who played for EA7 last year and the Italian national team in the most recent Eurobaket). If the newly acquired talent can provide Olympiacos a spark (along with Spanoulis continuing his strong play), then their chances of a 7th Euroleague Championship could strongly be within their grasp. Dario Saric is one of the most interesting players in the Euroleague due to his importance to Anadolu Efes as well as the Philadelphia 76ers who drafted him in 2014. In Group B, no player is more fascinating the Croatian Dario Saric. Saric was famously drafted No. 12 by the Magic in the 2014 NBA Draft and traded to Philly, though Philly knew full well that Saric wouldn’t be coming to the States for at least two years. Despite that, he remains a centerpiece for the Sixers future, and how he performs for Efes and in the Euroleague will be a sign whether General Manager Sam Hinkie’s gamble and “rebuilding” plan was worth it for the Sixers organization. It’s fascinating to see so much hope and pressure on a guy who most American basketball fans have never seen before. But, if last year was any indicator with Efes, then it is easy to see why the Sixers organization has been enamored with Saric. As a 20-year-old in his first full European club campaign, Saric averaged 9.9 ppg, 6.4 rpg, 2.4 apg and a PIR of 12.6 in 27 games for Efes. And Saric did this despite being a clear 2nd-3rd option behind Nenad Kristic and Stephen Lasme, and on a team whose style of play was more methodical (they averaged 75.3 ppg) and expected more physical play out of their taller post players. However, veterans Kristic and Lasme are both gone, so Saric now inherits the mantle as the premiere post player for Efes. Saric offers a balanced, inside-outside skill set, and displays strong athleticism and footwork for a player 6’10. He was tabbed the 2013 FIBA Europe Young Man’s player of the year, and has built a tremendous reputation for his performance in International competition as well as a strong work ethic and intensity for such a young player. Just check out this “Focus On” profile him below, and not only do his passing and scoring skills jump out at you, but his composure and maturity for a 20-year-old (actually 19 at the time of the interview). Efes doesn’t have a lot of big time names on their roster beyond Saric, so it’ll be interesting to see who will step up around him for Efes this season. Alex Tyus could be an interesting pickup, as he saw some valuable time for Maccabi Electra Tel Aviv the past 3 seasons, and was another member of their 2013-2014 Euroleague championship squad. Whoever becomes the main complementary player(s), the attention and high expectations will still be on Saric to help Efes make a playoff run to the Final Four (they have made it twice in club history, finishing 3rd both times). If he makes a big leap (and all signs are pointed to one) then not only expect Efes to succeed, but Sixers fans to be clamoring heavily for him, especially as they are expected to go through another rough season. Robbie Hummel of EA7 dunks the ball past Maccabi Fox Tel Aviv defender Dragan Bender in Game 1 of the Euro Classic in Chicago, which Maccabi won 85-79. EA7 won Game 2 at Madison Square Garden 76-72. Of the four remaining teams, EA7 has the best chance to make some noise, especially with the additions of perimeter scorers Robbie Hummel and Charles Jenkins, who should boost the consistency of the offense, something that EA7 struggled with at times last year. Also, they return Alessandro Gentile, who performed well for Italy at the FIBA Eurobasket (which the Italians finished 8th) and averaged 14.3 ppg last year for EA7. These three along with Oliver Lafayette, who averaged 6.8 ppg for Olympiacos last year, should provide EA7 with a solid backcourt. How their front court progresses though is a question, and it will be interesting to see who steps up in the post to help free things up for their talented perimeter players. Being one dimensional (i.e. relying on their perimeter players) may get them to the second round, but not much further than that against deeper and more balanced squads. Cedevita Zagreb doesn’t feature a lot of big names with mainstream basketball fans, but one: Jacob Pullen, the former Kansas State Wildcat. Pullen averaged 14.3 ppg for Basket Brindisi of the Italian League last year, and also has Euroleague experience from a stint with FC Barcelona a couple of years ago. It’ll be interesting to see if Pullen can help lead Cedevita to the second round and garner the fourth and final group spot, especially with Limoges CSP and Laboral Kutxa featuring mostly young, countrymen-heavy rosters, usually a sign of a rebuild for the club. Bogdan Bogdanovic (blue left) and Jan Vesely (blue right) are key to Fenerbahce preventing Sergio Rodriguez (13, white) and Real Madrid from repeating as Euorleague champions. Without a doubt, Group A in the upcoming 2015-2016 Euroleague season seems to be a “Group of Death” of sorts. All six teams have the horses to make a run to and in the Euroleague playoffs, but only four will come out advancing after the initial 10-game round-robin slate, as customary in the Euroleague first round. There will not be any “gimme” games in this group, which makes this group a “must-watch” for Euroleague fans on a nightly basis. To look at a few teams briefly, Khimki Moscow won the Eurocup last year, and earned promotion to the Euroleague thanks to star point guard and former Euroleague champion (during his time with Maccabi Electra Tel Aviv) Tyrese Rice, who returns to the Khimki squad this season. FC Bayern Munich added some valuable pieces to their roster, including KC Rivers, who brings a championship pedigree after a reserve role with Real Madrid last season, as well as post man Deon Thompson, a former member of the Munich squad two years ago who split time between Hapoel Bank Yahav Jerusalem of Israel and the Liaoning Jiebao Hunters of China in 2014-2015. And lastly, Crvena Zvezda Telekom Belgrade will be a dark horse of sorts, as they have one of the toughest home crowds in Europe, and they added legendary Greek center Sofoklis Schortsanitis, who had spent the past couple of seasons as the main post player for Maccabi Electra Tel Aviv, especially during their championship season in 2013-2014. But while the three above all have shots for second round and beyond dreams (as well as Strasbourg, who have an established coach in Vincent Collett, though to be frank, I see them as a bit of a longshot in this group, and sense them struggling a little bit more in their promotion than fellow recently promoted Euroleague squad Khimki), the heavy favorites in this group will be defending Euroleague champion Real Madrid and Spain and Fenerbahce Ulker Istanbul of Turkey, who appeared in the Euroleague Final Four. I have already chronicled Real Madrid a little bit on this blog before, but I really think that with Fenerbahce’s recent success, as well as impressive off-season, the defending champions could not only have serious competition in their group, but perhaps deep in the playoffs as well from Turkey’s premiere basketball club. Fenerbahce Celebrates after sweeping defending Euroleague champion Maccabi Tel Aviv in the Playoffs to earn a spot in the Final Four. Last year was a banner campaign for Fennerbahce, as they went 8-2 in group play and 11-3 in the second round. Their 19-5 overall record in the first two rounds included two wins over Olympiacos (who ended up finishing as runner-up) and EA7 Emporio Armani Milan, and an impressive victory of CSKA Moscow, another Final Four participant not just last season, but the season before as well. In the quarterfinals in a best of five format, Fenerbahce cruised on their home floor against Maccabi Electra Tel Aviv with an 80-72 victory in Game 1 and an 82-67 win in Game 2. On Maccabi’s home floor, Fenerbahce displayed their meddle, winning a tense pressure-filled contest on the road 75-74, much to the disappointment of the Israeli home crowd. 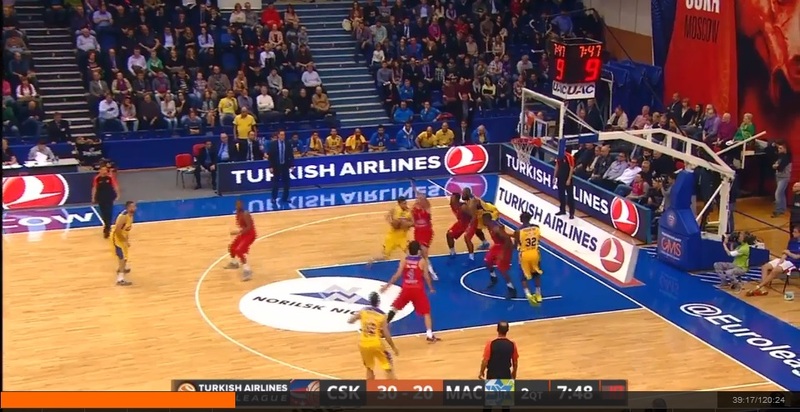 As you can see in the highlights below, despite the raucous home crowd, and the tough, desperate play from Maccabi to stave off elimination, Fenerbahce got big time performances and shots from players such as center Jan Vesely, and guards Bogdan Bogdanovic and Andrew Goudelock to propel them to the clinching Game 3 victory. Though they fell to Real Madrid 96-87 in the Final Four game, as well as CSKA Moscow in the 3rd place game, the Final Four appearance, their first in their history of participating in the Euroleague, was a strong accomplishment for the Turkish basketball club. They showed that not only should they be taken seriously as a team at the domestic level in Turkey, but also throughout European basketball circles in general. Last season, Fenerbahce was led by spark plug guards Goudelock and Bogdanaovic, who scored 17 and 10.6 ppg, respectively, as well as lanky, versatile forwards such as Vesely and Nemanja Bjelica, who scored 11.2 and 12.1 ppg and grabbed 5.4 and 8.5 rpg, respectively. Opposing teams struggled against Fennerbahce’s athleticism and up-tempo style, as they looked to push the ball on the offensive end in order to score in the fast break, and showed a lot of full and half court pressure defense techniques throughout the season to generate turnovers and easy points. Though they didn’t have the depth of some of the best teams in the Euroleague, they were a well-coached squad under Željko Obradović, and his coaching style and ability to maximize the talent of his roster was a big reason why the club reached the Euroleague Final Four for the first time in history. This year, Fenerbahce re-loaded in a big way. Though they did lose Goudelock and Bjelica, two key contributors from a year ago, they filled in the gaps with a lot of veteran talent, many who had contributed in the NBA just recently. This off-season, the Turkish club signed Pero Antic (most recently of the Hawks), Ekpe Udoh (most recently of the Clippers and a Top-10 NBA Draft pick) and Luigi Datome (most recently of the Boston Celtics). All those signing are a huge boost to Fenerbahce’s Euroleague hopes, as all those players were such key contributors to NBA teams as recently as last season (especially Antic, who seemed to be a bit of a fan favorite in Atlanta). With the exception of maybe Real Madrid, it’s hard to imagine a fellow Euroleague team that sports the kind of veteran pedigree that Fenerbahce possesses. Add that with another year of the core of Bogdanovic and Vesely (who has looked tremendous in Europe after flaming out in the NBA as a former lottery pick), and it’s easy to see why Real Madrid could have their hands full in Group play. Real Madrid certainly has the championship experience and a strong core built around their veteran home-country perimeter players such as Sergio Llull, Rudy Fernandez and Sergio Rodriguez. Furthermore, as defending champs and a former Euroleague player himself, it’s hard to imagine Pablo Laso not having Real Madrid ready for not just their upcoming games against Fenebahce, but the Euroleague in general. That being said, the depth of Fenerbahce, especially in the post will present quite a challenge to Real Madrid. While they do have veteran Felipe Reyes, Gustavo Ayon and the recently added Trey Thompkins, it is hard to see them really matching up with the NBA veteran posts Fenerbahce has in Antic, Udoh and Vesely. And as stated before, nobody has seen a career revitalization in Turkey like Vesely. Seen as soft, passive and ineffective, Vesely has developed a lot of toughness and explosiveness in Fenerbahce that has helped his game immensely. In the most recent FIBA Eurobasket, Vesely proved to be the catalyst for an overachieving Czech Republic team that made it to the quarterfinals, and showcased himself as one of the best players in the field, as he flashed the athleticism and intensity that was hardly seen during his time in the NBA. If you check out high highlights below, it is scary to think what Vesely could be capable of in year 2 with Fenerbahce. Group A has a lot of interesting stories and a lot of interesting teams that should be entertaining to watch and follow. But make no mistake about it: the number 1 spot out of the group will be battled between Fenerbahce and Real Madrid. It is still tough to pick against Madrid. Rodriguez and Llull are two of the best point guards in Europe, and have the capability to not just play, but succeed today in the NBA, and the chemistry this Real Madrid squad has simply cannot be matched by any other team in the Euroleague. One cannot overlook the importance of returning a majority of your squad from one year to the next, especially when the previous year resulted in a Euroleague title. But, as we know not just from the Euroleague, but basketball and sports in general, repeating is tough. And this Group does Real Madrid no favors. Fenerbahce may have been elated with their Final Four appearance last year, but they are looking to go beyond a 4th place finish this year, and they have signed the talent necessary to prove that last year was no fluke. It’ll be interesting to see if their newly acquired horses will help them overcome an experienced Madrid squad, and result in their first Euroleague title in 2015-2016. Post Malone and his basketball-inspired lyrics, make “White Iverson” one of the more refreshing Hip Hop tracks you’ll hear today. This post is coming a little late, but I didn’t want to overlook another Fresh Friday, a place to share some music as well as some basketball gems lurking on YouTube. This week’s edition centers on Hip Hop, specifically Post Malone, OB OBrien and A Tribe Called Red, which is more of a dubstep meets hip hop meets Native drum music. It’s a real treat, along with the other two listed above. This weekend is kind of a mellow weekend around Kansas City, as typical with most long weekends. That being said, the Royals and Chiefs are both playing Sunday, so you known people are going to get after it when comes to grilling and even tailgating (the Chiefs play at home). So it’s important that you have some good sundries and beats to complement your time with friends, even if the focus may not be of the basketball variety. This weekend’s beer of choice is Boulevard Funky Pumpkin. You want something you can easily drink, but you don’t want to have something you can down too quickly, especially on Sunday where the Chiefs and Royals will be playing back to back. Boulevard’s underrated October brew is a hybrid between a fall, Pumpkin ale and a sour beer. It’s a nice middle ground for those who may be averse to fall specialty ales as well as sour beers. The balance of sweetness and tartness makes this one of Boulevard’s more underrated ales, and you’ll feel good about drinking it too since Boulevard is a Kansas City brewery and you’ll be cheering on the Royals and Chiefs. Now onto the music and basketball. God. Those lines are so freaking great. A song with an Anthony Davis, James Harden, Shaq and of course AI reference? You better be listening to this song as you read this. If you are a Canadian right now, there is a lot to be happy about. Canadian basketball is finally surging toward major respectability, especially when it comes to their national team which features young, likable stars like Andrew Wiggins, Kelly Olynyk, Anthony Bennett, Nik Stauskas and Robert Sacre (well…maybe not a star, but I love Sacre from my experiences interviewing him at Gonzaga). The Toronto Raptors are the new “in” team again, something that faded away after Vince Carter stopped being “Air Canada” and went to the New Jersey Nets. The Toronto Blue Jays are in the playoffs for the first time since 1995 (though they dropped the first two games of the series at home to the Texas Rangers), and the NHL season is underway, which means hope springs eternal for Maple Leaf, Canucks, Flames, Oilers, Senators, Canadiens, and Jets fans. And when it comes to Rap music, Canada is experiencing its own renaissance as well. We all know about Drake, but there are also a lot of up and coming Rap artists that are starting to make their way into the mainstream as well. OB OBrien, a rapper from Hamilton, Canada who looks more like a Maple Leafs defenseman than budding musician, is a prime example of some of the Hip Hop talent from the land up North. While the lyrics aren’t anything special, his collaboration with Drake and P. Reign on this is a solid jam, and is a great party or club jam on a Friday and Saturday night. I do hope OB OBrien progresses his music, especially lyrics, a bit more as he gains more experience and popularity (I also hope so since I share the same surname as him), but this is a nice primer to Canadian rap music beyond Drake. While working on the Pine Ridge Indian Reservation in South Dakota, I got exposed to A Tribe Called Red a First Nations electronic group from Canada. While their debut self-titled album brought them on the scene in a big way (especially the track Electronic Powwow Drum), I felt that their second album Nations II Nations was a better, more well-rounded album featuring a lot more collaborating First Nations artists such as Northern Voice. A Tribe Called Red seamlessly brings together electronic, hip-hop and traditional First Nations drumming music into their tracks, and their sound is unique and refreshing and causes you to get lost in it for hours. “Working for the Government” is one of their newer tracks featuring Buffy Sainte Marie, and is a remix and revitalization of her earlier song of the same name from the 70’s. It’s 70’s meets modern day. AIM meets Wacipi meets dubstep. And it’s a great track that is the unique sound that showcases First Nations people in the light they deserve: creative, talented, and molding mainstream culture to enhance their own, not vice versa. The late 80’s marked the beginning of the NBA starting to globalize their brand and game. Part of that stemmed from the 1988 loss in the Olympic Championship game, but also a lot of it stemmed from a lot of the talent that existed globally, especially in Europe. Now, basketball is probably one of the most global games, and is certainly the fast growing sport in terms of popularity globally (and closing fast on Soccer, who seem to not be able to get out of their own way with all this corruption in FIFA). Just this pre-season, the NBA Global Games featured not only NBA exhibitions against European clubs such as Real Madrid, Fennerbahce Ulker Istanbul and EA7 Emporio Armani Milan, but also other European clubs on American soil (EA7 played Maccabi Fox Tel Aviv in Chicago). Basketball is huge, and the growing diversity of the game and its players is only good for the sport and its fans. The 1988 McDonald’s Championship is pretty much where the global revitalization started, as the Boston Celtics traveled to Spain to take on Real Madrid, who featured star point guard Drazen Petrovic, a legendary player of Croatian descent who played for the Portland Trail Blazers and New Jersey Nets (and the focus of one of the best 30 for 30’s ever, “Once Brothers”). The Celtics won 111-96, but Real Madrid and Petrovic showed the potential European basketball and players had and that the NBA game could benefit a lot from the European style. And that has been realized today, as European players and strategies influence the NBA and even college game in so many ways from the pick and roll to the stretch 4. Ironically, the Celtics played Real Madrid in this year’s Global Games in Spain earlier this week. The score? 111-96. The same exact score 17 years ago. It makes you wonder if that’s a sign of more things to come for the game globally.